touch the land and the safari co.
10 Reason To Join The Safari Co.
Part of our commitment to Africa is to give back to the people and places of this amazing continent through partnering with an organization called Touch the Land. We also seek to redistribute part of the revenue generated by advertising and marketing fees, to those people that need it most. We have a passion for Africa and want to see tourism make a difference in the lives of the people of this amazing continent. 1. Many of these business are community owned and operated. 2. Tourism businesses that benefit communities through partnerships, training and employment opportunities. 3. Some businesses are situated in communal areas, benefiting the surrounding communities directly. 4. There is a strong sense of an authentic taste of Africa's rich and varied history and culture. The Safari Co. then promotes these businesses through our extensive marketing network where they will reach potential customers to plan their holiday arrangements. Tourism plays a major role in job creation and makes a real difference in the lives of many communities throughout Africa. The best of all, when you use The Safari Co. website to plan your African safari you are making a real difference in the lives of the people in Africa! If that makes you feel good, that's exactly what it's suppose to do. It's great to do this together. We offer African travel businesses the opportunity to feature on The Safari Co. for a nominal fee (see why it makes sense to promote your business here). Part of this revenue contributes towards the well-being of communities across Africa, as we donate a portion of our revenue each year to Touch the Land. This is only the beginning as we aim to increase our impact every year. The Safari Co. is a professional, commercial business who's owners have been actively involved in the African tourism industry for more than a decade. 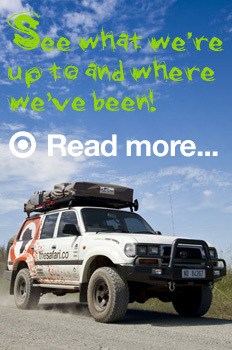 We use our commercial success as a social enterprise that finds it's roots deep in the African soil. We are committed to see whole communities taken out of poverty and together with these communities, we want to break the cycle of poverty through lending a helping hand in creating healthy, income generating, responsible communities that will sustain growth and commitment towards a better life. 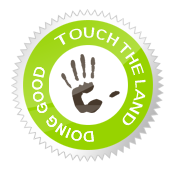 Touch the Land highlights businesses that make a difference in communities in Africa through development and cpnservation projects, creating employment or colaboration with communities for direct benefit. The initiative's vision is to build sustainable futures for some of the poorest people in Africa in partnership with the people being assisted. We know that a 'hand out' mentality takes dignity away from those that are suppose to benefit. It creates an unhealthy dependence on an outside source (that can stop giving at any time) and prevents people from being empowered to take themsleves out of poverty. Most people just need an opportunity to make radical changes to their own lives and that is what Touch the Land promotes. When you see this badge on a tourism service provider's profile, you'll know that the business directly contributes towards community development. Visit Africa to experience authentic hospitality, friendly smiles and true cultural experiences. With your participation we make a difference in the lives of communities across Africa. By making use of The Safari Co. (either as a traveler adding Touch the Land businesses as part of your safari or as a travel business working with communities) you directly contribute to effective community development in Africa. Tell all your friends about The Safari Co. Spread the word in the industry about The Safari Co.